The accepted and registered ones will be published in the conference proceedings to be published with International Conference Proceedings Series by ACM (ISBN: 978-1-4503-7183-4), which are to be indexed by Ei Compendex, Scopus, IET etc. major databases. ICRCA 2019 will bring together leading engineers and scientists in Robotics, Control and Automation fields from around the world. April 1, 2019 News! ICRCA 2018 proceedings are indexed by Scopus. October 30, 2018 News! 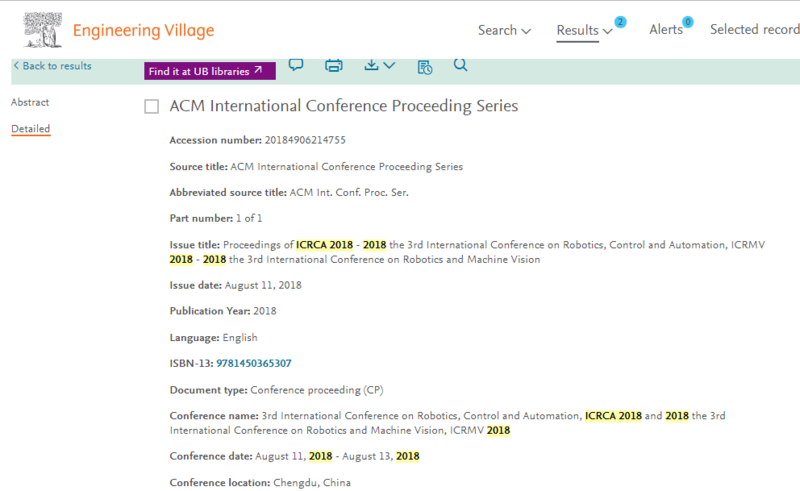 Papers of ICRCA 2018 have been archived in the ACM Digital Library (Click) ICRCA 2018 论文集入库ACM Digital Library. Derong Liu received the Ph.D. degree in electrical engineering from the University of Notre Dame in 1994. He was a Staff Fellow with General Motors Research and Development Center, from 1993 to 1995. He was an Assistant Professor with the Department of Electrical and Computer Engineering, Stevens Institute of Technology, from 1995 to 1999. He joined the University of Illinois at Chicago in 1999, and became a Full Professor of Electrical and Computer Engineering and of Computer Science in 2006. He was selected for the “100 Talents Program” by the Chinese Academy of Sciences in 2008, and now he serves as the Associate Director of The State Key Laboratory of Management and Control for Complex Systems at the Institute of Automation. He has published 15 books (six research monographs and nine edited volumes). He is an elected AdCom member of the IEEE Computational Intelligence Society and he is the Editor-in-Chief of the IEEE Transactions on Neural Networks and Learning Systems. He was the General Chair of 2014 IEEE World Congress on Computational Intelligence and is the General Chair of 2016 World Congress on Intelligent Control and Automation. He received the Faculty Early Career Development Award from the National Science Foundation in 1999, the University Scholar Award from University of Illinois from 2006 to 2009, and the Overseas Outstanding Young Scholar Award from the National Natural Science Foundation of China in 2008. He is a Fellow of the IEEE, the International Neural Network Society (INNS), International Association for Pattern Recognition (IAPR), and Chinese Association of Automation (CAA). Professor Beom Hee Lee received his B.S. and M.S. degrees in Electronics Engineering from Seoul National University, Seoul, Korea in 1978 and 1980, respectively, and his Ph.D. degree in Computer, Information, and Control Engineering from the University of Michigan, Ann Arbor, Michigan, USA in 1985. From 1985 to 1987, he was with the School of Electrical Engineering at Purdue University, West Lafayette, IN, USA, as an Assistant Professor. He joined Seoul National University (SNU) in 1987, where he is currently a Professor at the Department of Electrical and Computer Engineering and the Director of the Robotics and Intelligent Systems Lab at SNU. In 2001, he was the Program Chairman of the IEEE International Conference on Robotics and Automation (ICRA) in Seoul, Korea. Since 2004, he has been a Fellow of the IEEE Robotics and Automation Society, and he was in charge of IEEE Robotics and Automation Korea Chapter as the chairman until 2015. He was the President of the Automation and Systems Research Institute (ASRI) in SNU during 2004-2006, and the Dean of Information Technology in SNU. He has served the Korea Robotics Society (KROS) as the president in 2009. He was also in charge of the Board of Directors of the Korea Institute of Patent Information (KIPI) as the chairman. He has published over 670 technical journal and conference papers mainly in the field of Robotics and Automation. His current interest includes multi-robot systems and applications, Multi-robot collision avoidance, Multi-robot SLAM problems and Underwater robotics. Speech Abstract--Nowadays, multi-robot operations are acknowledged as a common practice in industry for various tasks. State of the Art of Multi-Robot Systems are described in the first statement. Multi-robot research issues are then discussed in terms of the operational strategies: centralized, distributed, and mixed operational schemes. Next, we show that one of the main issues in multi-robot operation is the problem of collision avoidance. We also show the importance of the collision avoidance problem in multi-robot operations. For multi-robot collision avoidance, a special tool, called the collision map, is introduced and applied to the problem of multi-robot collision avoidance. More deep analysis and investigation are presented for an application of the collision map. Various types of collision maps are then introduced with several possible applications. Also, robot path modification is viewed in terms of collision avoidance using the concept of collision map. Various applications using the collision map are presented for a problem of 100 multi-robot operations, a stealth intruder intercept scheme, and efficient multiple cleaning robots operation. Especially, the load balancing in multiple cleaning robots are realized using the collision map. Finally, future applications using multi-robot systems are briefly discussed. Dr. Chun-Yi Su received his Ph.D. degrees in control engineering from South China University of Technology in 1990. After a seven-year stint at the University of Victoria, he joined the Concordia University in 1998, where he is currently a Professor of Mechanical and Industrial Engineering and holds the Concordia Research Chair in Control. He has also held several short-time visiting positions including a Chang Jiang Chair Professorship by China's Ministry of Education and JSPS Invitation Fellowship from Japan, and Qian Ren Talents Professor from China. His research covers control theory and its applications to various mechanical systems, with a focus on control of systems involving hysteresis nonlinearities. He is the author or co-author of over 400 publications, which have appeared in journals, as book chapters and in conference proceedings. In addition to his academic activities, he has worked extensively with industrial organizations on various projects. Dr. Su has been an Associate Editor of IEEE Transactions on Automatic Control, IEEE Transactions on Control Systems Technology, Mechatronics, Control Engineering Practice, and several other journals. He has served as Chair/Co-Chair for numerous international conferences. Submissions that are identical (or substantially similar) to versions that have been previously published, or accepted for publication, or that have been submitted in parallel to other conferences or journals are not appropriate for ICRCA and violate our dual submission policy. Your registration will be confirmed by icrca@young.ac.cn when it's successful; if you fail to receive any feedback, please contact us. A standard 30-day visa is activated on the date you enter China, and must be used within three months of the date of issue. 60-day and 90-day tourist visas are reasonably easy to obtain in your home country but difficult elsewhere. To stay longer, you can extend your visa in China at least once, sometimes twice. Visa applications require a completed application form (available at the embassy or downloaded from its website) and at least one photo (normally 51mm x 51mm). You normally pay for your visa when you collect it. A visa mailed to you will take up to three weeks. In the US and Canada, mailed visa applications have to go via a visa agent, at extra cost. In the US, many people use the China Visa Service Center, which offers prompt service. The procedure takes around 10 to 14 days. Air Guangzhou Baiyun International Airport, being located on the border of the northern Renhe Town, Baiyun District, and the eastern Xinhua Town, Huadu District, is about 28 kilometers (17.4 miles) from the airport to downtown area of the city. It is one of the three largest air hubs in China. Passport holders of 53 countries and regions are granted a visa-free stay of up to 144 hours when taking an international transfer via Guangzhou Baiyun Airport. Read details about 144-Hour Visa-Free Transit. Guangzhou has three railway stations handling passenger transport. The Railway Station at Huanshi Road is the largest and the most important one, operating trains between the city and Beijing, Wuhan, Nanjing, Chengdu, Chongqing, Xi'an, Lhasa and many other China cities. The East Railway Station (Tianhe Railway Station) mainly provides through trains from to Hong Kong and frequent bullet trains between to Shenzhen. The North Railway Station in Huadu District is a small station mainly operates bullet trains between the city and Wuhan. City Bus City buses are easily accessible in the city, including daytime lines, night lines, airport shuttle buses, tourist buses and BRT lines. Apart from that, three sightseeing bus lines are in service which take tourists to the major attractions in town. Taxi A taxi charges CNY10 for the first 2.5 kilometers (1.55 miles) and CNY2.6 for succeeding each kilometer (0.6 mile). When a taxi runs farther than 35 kilometers (21.7 miles), extra 50% will be automatically charged for empty return. Water Bus The water transport in this city is mainly made up of Suigang Port, Zhoutouzui Port, Zengcheng Xintang Port, Panyu Lianhuashan Port and Nansha Port. There are six water buses running along the Pearl River, supplying residents and tourists with a more convenient transport service with four piers along the line - Zhongda Ferry Pier, Tianzi Ferry Pier, Xidi Ferry Pier and Fangcun Ferry Pier. The whole journey takes 40 minutes and costs CNY2. As the third longest river in China, the Pearl River with a length of more than 2,000 kilometers (about 1,243 miles). Cruising on Pearl River undoubtedly is one of the best things to do in Guangzhou at night. Cruising along the river let you get a whole new take on the city. You can enjoy the Haizhu Square, the famous Canton Tower, as well as various towering skyscrapers. Canton Tower has become a landmark of the city, so it is also one of must-see places in Guangzhou. As the highest tower in China, Canton Tower has a height of 600 meters (1,968 feet). Ascending Canton Tower, you cannot only enjoy a wonderful bird’s view of the whole city but also have a chance to experience some extreme challenges. The Cantonese Morning Tea is more like a gorgeous breakfast which includes the tea and dim sums in more variation than you know. Surely you should try the classical ones like Shrimp Dumpling, Steamed Shaomai, and Steamed Vermicelli Roll. Sun Yat-sen Memorial Hall is one of the must-see places in Guangzhou because of its historical significance. It was built in commemoration of the Chinese great revolutionary leader Sun Yat-sen (1866 -1925). A witness to so many historical events, the Memorial Hall now is an important venue for large gatherings and performances in Guangzhou. As the most famous mountain of the city, White Cloud Mountain offers wonderful hiking routes. Spending a weekend there is one of the fun things to do in Guangzhou for the local people. It consists of more than 30 peaks and Moxing Ridge is the highest one among them. Standing on the peak, you can enjoy a spectacular view of the whole city. Chimelong Tourist Resort is composed of a series theme parks including Chimelong Paradise, Safari Park, Water Park, International Circus, and Birds Park. Meanwhile, watching a fantastic circus performance is one of the best things to do in Guangzhou at night. As for the Water Park, it is a cool place to have a good time with friends or families in summer.